Glut with joy the heart tied to your heart for eternity with this gift of Inflated Shimmer 10 Red Gerberas Bouquet and strengthen the fabric of this special heart tie. This Precious Bloom 15 Red Gerberas Bouquet is a fitting present to bestow your husband with on the 1st year of your marriage and to thus embellish the blooming romance between you two. 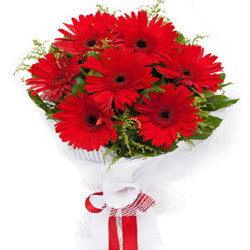 This Precious Bloom 20 Red Gerberas Bouquet is a fitting present to bestow your husband with on the 1st year of your marriage and to thus embellish the blooming romance between you two.